Manuel Lepe, Puerto Vallarta’s most important and celebrated artist of the 1960s, was named Mexico’s Artist by President Echeverria. His paintings depict an innocent vision of Puerto Vallarta children at play in the beautiful surroundings in which they live. So beloved are his works, Unicef uses his paintings to promote the well-being of children worldwide. In 1984, Lepe died in the prime of his career at age 46. 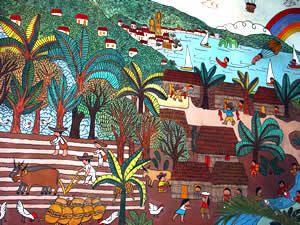 Manuel Lepe’s gorgeous mural graces City Hall, and is a must-see for all visitors to Puerto Vallarta. The old City Hall building is just across from the north side of the Town Square in Centro. Just enter the building and as you walk upstairs you’ll see this huge and beautiful mural.